People can survive for weeks without food and a few days without water but only minutes without oxygen (O2). All cells in the body need a steady supply of oxygen to generate energy to grow, heal, and sustain essential bodily functions. The thoracic cavity encloses the heart and the lungs. The abdominal cavity contains the stomach, liver, gallbladder, spleen, pancreas, and small and large intestines, kidneys, and bladder. These two cavities share mobility during breathing. For example, during pregnancy or after a big meal, the overall volume of the abdominal cavity increases, which corresponds to a decrease in the thoracic cavity. 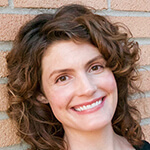 This is why it is more difficult to breathe after eating a large meal or when pregnant. In the context of breathing, the abdominal cavity can be viewed as a water balloon—when it is squeezed it changes shape, but not volume. What are the Parts of the Respiratory System? The respiratory system is divided into two parts: upper respiratory tract and lower respiratory tract. 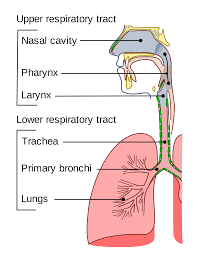 The upper respiratory tract includes the nose, mouth, pharynx, and larynx. When a person breathes in through their nose, the air is “filtered” through natural lines of defense that defend against illness and irritation of the respiratory tract. Nasal hairs, or vibrissae, at the opening of the nostrils, trap large particles that might otherwise be inhaled. The entire respiratory system is lined with a mucous membrane that secretes mucus, as is the digestive, urinary, and reproductive systems—this is also a protective mechanism that traps smaller particles like smoke or pollen. Cilia, hairlike structures, line the mucous membrane of the nose and move out the trapped particles. Breathing through the mouth instead of the nose, such as during exercise, when sleeping, or when the nose is congested, causes air to bypass much of the body’s natural air filtering and temperature treatment. Mouth breathing may allow allergens, germs, and other pollutants to flow into the lungs, where they have the potential to irritate or damage sensitive tissues. The pharynx is about five inches long and connects to the nasal and oral cavities. It is a funnel-shaped, muscular tube that houses the tonsils and the adenoids, which are a part of the lymphatic system that guards the body against infection by releasing white blood cells, such as T and B lymphocytes. The windpipe, or trachea, is the tube that unites the throat and the bronchi. The trachea then divides into two bronchi tubes. 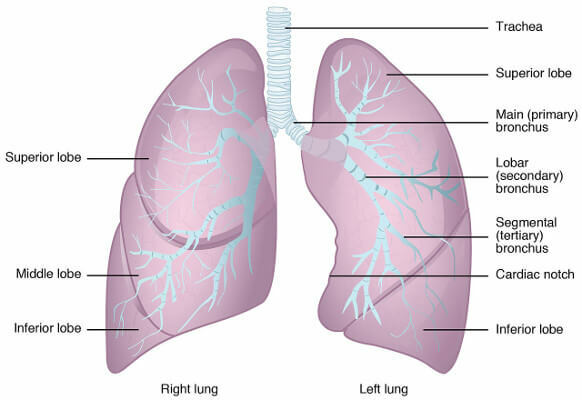 One bronchus progresses to the right lung, the other to the left lung. Inside the lungs, each of the bronchi divides into smaller branches, known as bronchioles. The bronchioles end in the pulmonary alveolus. The alveolus consists of tiny air sacs with blood capillaries called the pulmonary alveoli, where gas exchange takes place. The capillaries are full of red blood cells containing special proteins called hemoglobin. Oxygen is absorbed from the air into the blood capillaries through the alveoli, then the action of the circulatory system circulates oxygen-rich hemoglobin through all the tissues in the body. 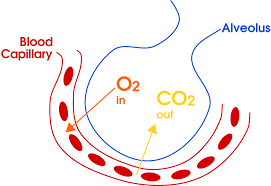 Simultaneously, carbon dioxide (CO2) is moved from the hemoglobin into the alveoli to be expelled through the bronchi and out the upper respiratory tract. Gas exchange, or diffusion of gases in the alveoli, takes place over a large surface area because of the structure of the air sacs within the alveoli. When a fetus is in utero, the mother provides the fetus oxygen and nutrients, basically doing the breathing for the fetus. The mom’s lungs deliver O2, oxygenated blood, to the uterus and placenta. From there, the O2 travels to the umbilical cord, which takes about half the oxygenated blood to the inferior vena cava while the other half is transported to the liver. At this point, the two sides of the fetus’ heart are connected, bypassing the lungs, which remain dormant until the child is born. Oxygen and nutrients are exchanged via diffusion—the mother’s blood does not circulate through the fetus. At birth, for the first time, the infant needs to engage in an action to survive autonomously. The very first action is the breath, a forceful inhalation, which stimulates changes to the entire circulatory system. Blood immediately floods to the lungs, and the heart prepares for survival away from the mother. When a healthy baby is born, the baby takes its first breath as a response to the lack of oxygen it is experiencing. Its lungs continue to prepare for more air by increasing the surface area within the lungs. As this occurs, the lower pressure in the lungs forces the outside air, which is a higher pressure, to flow into the baby’s lungs—air always flows toward an area of lower pressure. 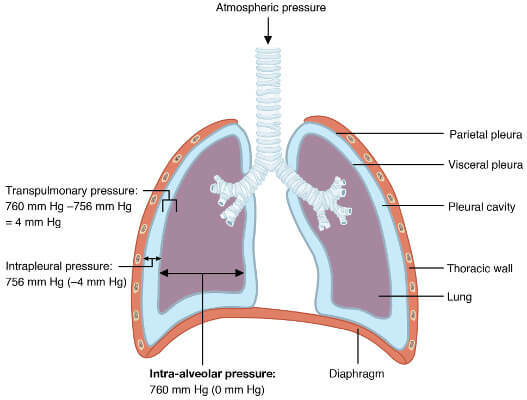 The lungs do not actually pull air in during inhalation—air is pushed in by atmospheric pressure. The actual force of air is from outside of the body. It is the shape of the thoracic cavity that lowers and increases the pressure within the lungs, the intrapleural pressure. The body creates the space, and the atmosphere fills it. During exhalation, the reversal occurs. The lung tissue which has stretched open, springs back to their initial volume, thus pushing the air out, this is called passive recoil. The body uses the autonomic nervous system, the brain’s unconscious control center for the body’s vital functions, to get the respiratory control center moving. 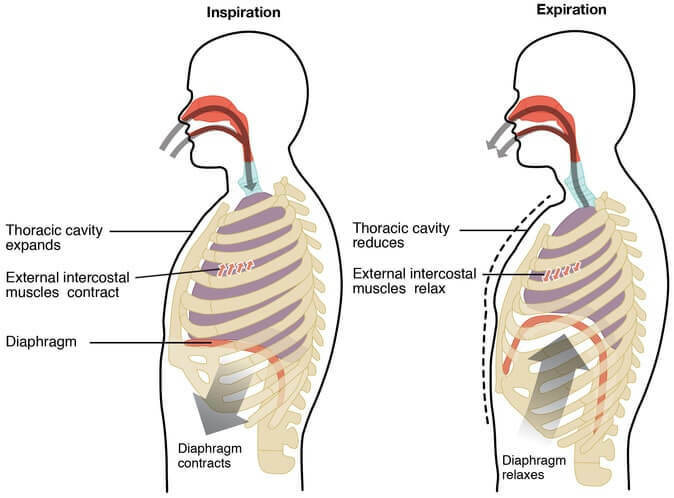 As the body prepares for oxygen rich air, the control center sends signals down the spine and to the muscles involved in breathing—the diaphragm and accessory muscles, such as the intercostal muscles. These signals tighten and relax automatically, without the person being aware of it. The diaphragm for example, relaxes during exhalation and contracts, or flattens, during inhalation. Breathing is mostly an autonomic response from the respiratory control center in the base of the brain; however, to a degree, a person can change the breathing rate and length (see table 1). Physical activity, emotions, breathing exercises, and air contaminants are all examples of how the breathing pattern can be altered. Oxygen can also be moved by other means such as, yawning, sneezing, laughing, hiccuping, and coughing. To adjust to the body’s changing needs, the body has many sensors in the brain, blood vessels, muscles, and lungs. The brain and the two major blood vessels, the carotids, that can detect O2 and CO2 levels in the blood and change the respiratory rate as needed. Sensors also detect lung irritants to trigger coughing or sneezing. In a person with asthma, the sensors may cause the muscles in the airways to contract; which makes the airways constrict to a smaller diameter. Often referred to as causing airway resistance. Detecting and recognizing oxygen levels from outside the body is done by using a pulse oximeter. Skilled observers, even under ideal conditions, cannot consistently detect hypoxemia, or low blood O2 saturation (SaO2), until levels fall below 80%. The normal O2 saturation level at sea level is between 94%–100%. Table 1. The average respiratory rate by age. Respiratory illness is a frequent problem. Infections and smoking are most often the cause. The following are five common respiratory disorders, not including upper respiratory infections (URIs). Other diseases and illnesses of the respiratory system are listed in table 2. Asthma is caused by consistent irritation in the airway that causes airway resistance. Symptoms include lung spasms with wheezing and shortness of breath. 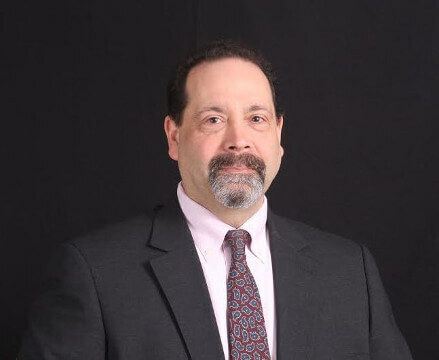 According to the Centers for Disease Control, Chronic obstructive pulmonary disease (COPD), is the third-leading cause of death in the United States. COPD is an umbrella term that comprises several respiratory illnesses that cause breathlessness or the inability to exhale normally. There are two main types of bronchitis, acute and chronic. Acute bronchitis is an infection that causes the mucous membrane in the lungs to become inflamed in the bronchial passage. Chronic bronchitis is a form of COPD that is characterized by a chronic cough. In both cases, swelling can constrict or obstruct the airways in the lungs. Emphysema is another form of COPD, usually caused by smoking. Those who suffer from emphysema have trouble exhaling air from their lungs. The recoil of the lungs has lost its elasticity. In emphysema, cigarette smoke damages the air sacs to a point where they can no longer repair themselves. Lung cancer is a leading cause of death among women and men in the United States. Lung cancer can form in any part of the lung and is difficult to detect. Most often, tumors develop near the air sacs. Table 2. Other diseases and illnesses of the respiratory system. Other Diseases and Illnesses Cont. Note. This list is noninclusive. Please contact us at support@pacificmedicaltraining.com to reach the author to recommend other ailments that interest you. Avoid exposure to air pollutants, such as secondhand smoke, outdoor air pollution or pollens, and chemicals in the home and workplace. Frequent hand washing. Alcohol-based cleaners are a good substitute if running water is not available. Avoid crowds during the cold and flu season. Get vaccinated every year against influenza or pneumonia. Talk to a health-care provider about the risks and benefits before making a decision to vaccinate. Vaccinations are not not always recommended. Aerobic exercise helps improve lung capacity. Specific breathing exercises may also improve lung function. Avoid exercising outdoors on bad air days.